When Apple launched iOS 7 in September, users of legacy handsets like the iPhone 4 experienced sluggish performance as the old hardware tried to keep pace with the advanced operating system. As seen in the chart above, created by ArsTechnica, iPhone 4 users upgrading from iOS 6.1.3 to iOS 7 saw sluggish app launching and a significant hit to overall system performance. For example, the "zoom-in" animation seen when opening an app was noticeably jerky, as was pulling up Control Center. After conducting a series of tests with the iPhone 4 running Apple's recently released iOS 7.1, the publication reports performance is greatly improved. Tweaks made on the backend now offer users of older hardware a smoother experience, while app launch and system startup times have been dramatically reduced. Apple attempted to make iOS 7 as backwards compatible as possible, but the operating system's design is heavy on animations, transitions and other graphical flourishes built to take advantage of the latest A7 system-on-a-chip. The company looked to solve some of the performance issues with iOS 7.0.3, but for iPhone 4 owners, the changes did not offer a substantial improvement. In a separate report from BEEKn, iOS 7.1 brings new functionality to Apple's iBeacon protocol, opening the door for "always on" beacon tracking. 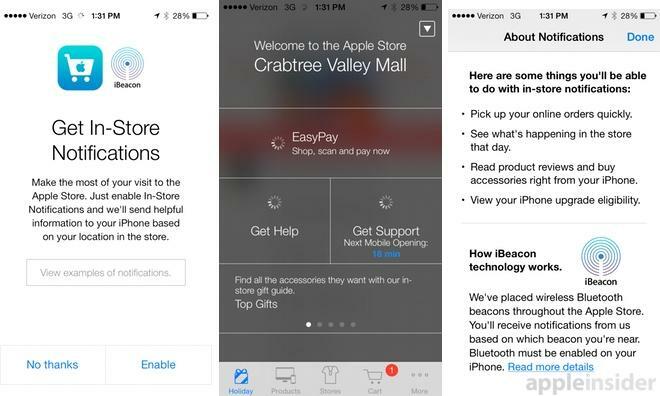 Apple's own Apple Store app was one of the first to support iBeacon integration. Conducting various tests with iBeacon-compatible apps, the publication found iOS 7.1 allows software to search for beacon signals even after the app has been closed and the iPhone rebooted. Previously, apps would only receive iBeacon notifications when open or running in the background. With the new implementation, once an iBeacon app is installed, it will constantly "look" for signals until a user opts out via the Location Services settings menu, turns off Bluetooth or deletes the app. What remains unclear, however, is how Apple plans to handle iBeacon spam, which can now be pushed to devices as long as a provider's app is installed. Finally, the publication feels that Bluetooth LE is more responsive in iOS 7.1 as region changes, exits and beacon identification are now logged almost instantly. The findings have yet to be verified.